Designed to accommodate your active lifestyle, this Omega Seamaster stainless steel quartz watch for women is a great choice for rough-and-tumble adventures thanks to its water resistance to 300 meters (984 feet). This sporty timepiece measures 28mm wide (1.1 inches) and is topped by a unidirectional elapsed time bezel in blue with scalloped edges for a good grip under any condition. The wavy blue dial face includes luminous dotted hour markers, luminous skeleton hands (with seconds hand), and a date window at 3 o'clock. 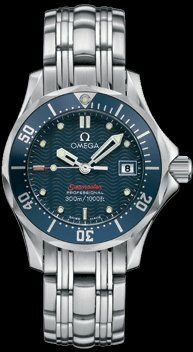 Other features include a precise Swiss quartz movement (Omega caliber 1456) and scratch-resistant and glare-proofed domed sapphire crystal.